Aghion, P.; Howitt, P. 2009. The economics of growth. The MIT Press, Cambridge, Massachusetts. 495 p.
Alberta Government. 2011. Progress report 2011, responsible actions: a plan for Alberta’s oil sands. Government of Alberta, Edmonton. 15 p.
Amacher, G.S. ; Ollikainen, M.; Koskela, E. 2009. Economics of forest resources. The MIT Press, Cambridge, Massachusetts. 397 p.
Arcand, A.; Lefebvre, M. 2011. Canada’s lagging productivity: what if I had matched the U.S. performance? The Conference Board of Canada, Briefing October 2011. 18 p.
Armitage, D.; Berkes, F.; Doubleday, N. 2007. Introduction: moving beyond co-management. Pages 1–15 in Derek Armitage, Fikret Berkes, and Nancy Doubleday eds. Adaptive co-management. UBC Press, Vancouver. 344 p.
Arrow, K.J. ; Cropper, M.L. ; Eads, G.C. ; Hahn, R.W. ; Lave, L.B. ; Noll, R.G. ; Portney, P.R. ; Russel, M.; Schmalensee, R.; Smith, V.K. ; Stavins, R.N. 1996. Is there a role for benefit-cost analysis in environmental, health, and safety regulations? Science, 22: 221-222. Bare, B.B. ; Waggener, T.R. 1980. Forest land values and return on investment. For. Sci., 26(1): 91-95. Barrett, G.W. ; Odum, E.R. 2000. The twenty-first century: the world at carrying capacity. BioScience, 50(4): 363-368. Bassanini, A.P. 1997. Localized technological change and path-dependent growth. Interim Report: IR-97-086, International Institute for Applied Systems Analysis. 30 p.
Beattie, B.R. ; Taylor, C.R. 1985. The economics of production. John Wiley & Sons, Inc., New York, NY. 258 p.
Bentley, W.R.; Teeguarden, D.E. 1965. Financial maturity: a theoretical review. For. Sci., 11(1): 76-87. Berkes, F. 1993. Traditional ecological knowledge in perspective. Pages 1-6 in J. Inglis, ed., Traditional ecological knowledge: concepts and cases. International Development Research Centre, Ottawa, ON. 142 p.
Besanko, D.; Braeutigam, R.R. 2002. Microeconomics: an integrated approach. John Wiley & Sons, Inc., New York, NY. 809 p.
Bowles, S. 2004. Microeconomics: behavior, institutions, and evolution. Princeton University Press, Princeton and Oxford. 584 p.
Bromley, D.W. 1991. Environment and economy: property rights & public policy. BlackWell Publishers, Cambridge, MA. 247 p.
Canadian Council of Forest Ministers. 2008a. Forest sector innovation framework. Natural Resources Canada, Canadian Forest Service, Ottawa, ON. 12 p.
Canadian Council of Forest Ministers. 2008b. A vision for Canada’s forests, 2008 and beyond. Natural Resources Canada, Canadian Forest Service, Ottawa, ON. 15 p.
Canadian Forest Service. 2008. The state of Canada’s forests: annual report 2008. Natural Resources Canada, Canadian Forest Service, Ottawa, ON. 40 p.
Canadian Forest Service. 2009. The state of Canada’s forests: annual report 2009. Natural Resources Canada, Canadian Forest Service, Ottawa, ON. 55 p.Canadian Forest Service. 2011. Squeezing more values from trees: http://cfs.nrcan.gc.ca/ Accessed on Nov. 10, 2011.Canadian Forest Service. 2012. A brief statement on the benefits of forest resources provided on the Web page: http://cfs.nrcan.gc.ca/home, accessed on April 12, 2012. Catton, W.R. 1982. Overshoot: the ecological basis of revolutionary change. University of Illinois Press, Chicago. 298 p.
Caves, D. Christensen, L.R. ; Diewert, W.E. 1982b. Economic theory of index numbers and the measurement of input, output, and productivity. Econometrica 50(6):1393-1413. Caves, D.; Christensen, L.R. ; Diewert, D.E. 1982a. Multilateral comparisons of output, inputs, and productivity using superlative index numbers. Econ. J. 92:73-86. Caves, D.W.; Christensen, L.R. ; Tretheway, M.W. 1981. U.S. trunk air carriers, 1972-1977: a multilateral comparison of total factor productivity. Pages 47-76 in T.G. Cowing and R.E. Stevenson, eds. Productivity measurement in regulated industries. Academic Press, New York, NY. 417 p.
Chambers, R.G. 1988. Applied production analysis: a dual approach. Cambridge University Press, New York. 331 p.
Chang, S.J. 1998. A generalized Faustmann model for the determination of optimal harvest age. Can. J. For. Res. 28: 652-659. Christensen, L.R., Jorgenson, D. W., 1969. The measurement of U.S. real capital input, 1929-1967. Rev. Income Wealth 15(4): 293-320. Coase, R.H. 1960. The problem of social cost. The J. Law & Econ. Vol. 3: 1-44. Coase, R.H. 1998. The new institutional economics. The Am. Econ. Rev. 88(2): 72 – 74. Conrad, J.M. 2010. Resource economics (2nd ed.). Cambridge University Press, New York, NY. 285 p.
Cornes, R.; Sandler, T. 1999. The theory of externalities, public goods, and club goods (2nd edn. 1999 reprint). Cambridge University Press, New York, NY. 590 p.
Daly, H.E. ; Farley, J. 2004. Ecological economics: principles and applications. Island Press, Washington, DC. 454 p.
Davis, L.S. ; Johnson, K.N. ; Bettinger, P.; Howard, T.E. 2005. Forest management: to sustain ecological, economic, and social values. Reissued by Waveland Press, Inc., Long Grove, Wellinois. 804 p.
Demsetz, H. 1967. Towards a theory of property rights. The Am. Econ. Rev. 57(2): 347-359. Diewert, W.E. 2000. The challenges of total factor productivity measurement. International Productivity Monitor, 1(1): 45-52. Diewert, W.E. ; Nakamura, A.O. 2002. The measurement of aggregate total factor productivity growth. Dept. of Economics, University of British Columbia, Discussion Paper No. 02-05. 77 p.
Dykstra, D.P. ; Heinrich, R. 1996. FAO model code of forest harvesting practice. FAO, Rome 85 p.Ecological Society of America. 2000. Ecosystem services: a primer, retrieved from http://www.actionbioscience.org/environment/esa.html? print on October 27, 2010. Edgar, L.; Marshall, C.; Basset, M. 2006. Partnerships: putting good governance principles in practice. Institute on Governance, Ottawa, Ontario. 22 p.
Ela, J.S. 2009. Law and norms in collective action: maximizing social influence to minimize carbon emissions. J. Env. Law, 27(93): 93-144. Essletzbichler, J.; Winther, L. 1999. Regional technological change and path dependency in the Danish food processing industry. Geografiska Annaler, 81 A (3): 179-196. Freeman, K.D. ; Oum, T.H. ; Tretheway, M.W. ; Waters, W.G. II. 1987. The growth and performance of the Canadian transcontinental railways, 1956-1981. Centre for Transportation Studies. Univ. British Columbia, Vancouver, B.C. 345 p.
Ghebremichael, A.; Williams, J.; Vasievich, J.M. 1996. A manager’s guide to forestry investment analysis. Natural Resources Canada, Canadian Forest Service, Great Lakes Forestry Centre, Sault Ste. Marie, ON. Ghebremichael, A.; Cortner, H.J. 2003. 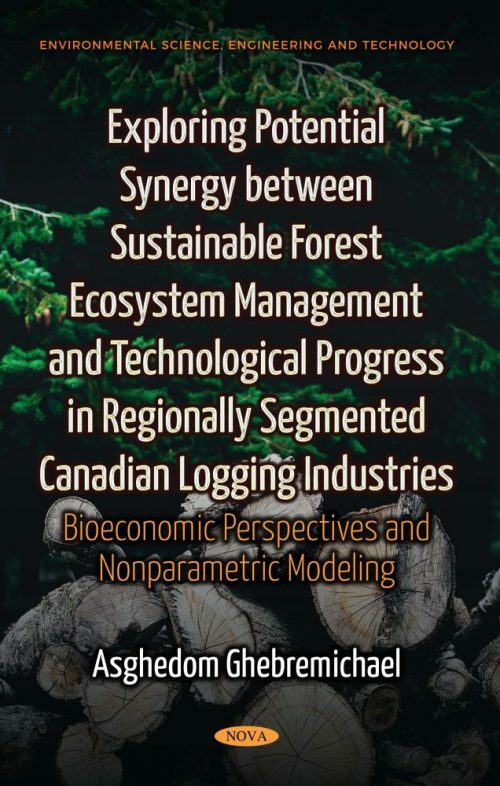 Social science research for sustainable forest management in Canada: a survey of opportunities and challenges. Page 248, paper abstract # 0371, in: Congress Proceedings, C-People and Forests in Harmony, XII World Forestry Congress, Quebec City, Quebec, Canada. Ghebremichael, A.; Nanang, D.M. 2004. Inter-regional comparative measures of productivity in the Canadian timber harvesting industry: a multilateral index procedure. Inf. Rep. NOR-X-391. Northern Forestry Centre, Natural Resources Canada, The Canadian Forest Service, Edmonton. 36 p.
Ghebremichael, A.; Roberts, D. G.; Tretheway, M. W. 1990. Productivity in the Canadian sawmilling industry: an inter-regional comparison. Forestry Canada, Ontario Region, Great Lakes Forestry Centre. Information Report 0-X-411. Government of Canada. 2003. A framework for the application of precaution in science-based decision making about risk. National Library of Canada, Cat. No. CP22-70/2003. 13 p.
Government of Canada. 2003. First Nations Forestry Program: 2003/04-to 2007/08 in partnership with First Nations. Natural Resources Canada, Ottawa, ON, (English and French booklet), 24 p.
Grant, J.; Dyer, S.; Woynillowicz, D. 2008. Fact or fiction? Oil sands reclamation. The Pembina Institute, Drayton Valley, Alberta. 75 p.
Gujarati, D.N. 2003. Basic econometrics (4th ed): international edition. McGraw-Hill Company, Boston. 1002 p.
Gunton, T.; Richards, J. 1987. Resource rents and public policy in western Canada. Institute for Research on Public Policy, Halifax, NS. 261 p.
Hardie, I.W. ; Daberkow, J.N. ; McDonnell, K.E. 1984. A timber harvesting model with variable rotation lengths. For. Sci., 30(2): 511-523. Hardin, G. 1996. The tragedy of the commons. Pages 127-143 in Daly, H.E. and Townsend, K.N., eds. Valuing the earth, economics, ecology, and ethics (6th printing). MIT Press, Cambridge, MA. 387 p.
wiki/Invention, accessed on May 4, 2012. Hulten, C.R. 2001. Total factor productivity: a short biography. Pages 1-52 in Hulten, Dean, and Harper eds. New Developments in Productivity Analysis. Studies in Income and Wealth, Volume 63. 631 p.
Independent Panel on Federal Support to Research and Development. 2011. Innovation Canada: a call to action. Public Works and Government Services Canada, Ottawa. 131 p.
Innes, J.E. ; Booher, D.E. 2003. The impact of collaborative planning on governance capacity. Working Paper 2003-03. Institute of Urban and Regional Development, University of California, Berkley. 32 p.
International Tropical Timber Organization. 2001. Tropical Forest Update vol. 11(2). Yokohama 220-0012, Japan. Johnson, D.W. 1994. Reasons for concern over impacts of harvesting. Pages 1 – 12 in Dyck, W.J. ; Cole, D.W.; Comerford, N.B., eds. Impacts of forest harvesting on long-term site productivity. Chapman & Hall, New York, NY. 364 p.
Kant, S. 2003. Extending the boundaries of forest economics. Forest Policy and Economics, 5(2003): 3956. Kennedy, C.; Thirlwall, A.P. 1972. Surveys in applied economics: technical progress. The Econ. J., 82(325): 11-72. Kernaghan, K.; Siegel, D. 1995. Public administration in Canada, a text 3rd. edn. Nelson Canada, Toronto. 706 p.
Kimmerer, R.W. 2002. Weaving traditional ecological knowledge into biological education: a call to action. BioScience 52(5): 432-438. Kimmins, H. 1999. Balancing act: environmental issues in forestry (2nd ed.). UBC Press, Vancouver. 305 p.
Klemperer, W.D. 1996. Forest resource economics and finance. McGraw-Hill, Inc., New York, NY. 551 p.
Licht, A.N. 2008. Social norms and the law: why peoples obey the law. Rev. Law and Econ., 4(3): 715-750. Lipsey, R.G. ; Carlaw, K.I. ; Bekar, C.T. 2005. Economic transformations, general purpose technologies and long-term economic growth. Oxford University Press, New York, NY. 595 p.
Luckert, M.K. ; Williamson, T. 2005. Should sustained yield be part of sustainable forest management? Can. J. Res. 35: 356-364. MacMillan, J.A. 1976. A critique of “Benefit-Cost Analysis Guide”, Planning Branch, Treasury Board Secretariat (Ottawa: Information Canada, 1976), 80 pages. Can. J. Ag. Econ., 24(3): 50-54. Millennium Ecosystem Assessment. 2003. Ecosystems and human Well-being: a framework for assessment. Island Press, Washington, DC. Millennium Ecosystem Assessment. 2005a. Living beyond our means: natural assets human Well-being, a statement from the Board. United Nations Environment Program (UNEP), New York, NY. 24 p.
Millennium Ecosystem Assessment. 2005b. Ecosystems and human Well-being: opportunities and challenges for business and industry. World Resources Institute, Washington, DC. 29 p.
Mukhopadhyay, A. 2003. Malthus` population theory: an irony in the annals of science. Breakthrough, 10(3): 1-10. Nanang, D.M. ; Ghebremichael, A. 2006. Inter-regional comparison of production technology in Canada’s timber harvesting industries. For. Pol. and Econ. 8(2006): 797-810. Natural Resources Canada. 2001. Forestry business panning guide. First Nations Forestry Program. Canadian Forest Service, Ottawa, Ontario. 35 p.
Natural Resources Canada. 2003. First Nations forestry program 2003/04-2007/08: in partnership with First Nations. Natural Resources Canada, Ottawa, ON. 24 p. (English and French). Natural Resources Canada. 2010. The state of Canada’s forests: annual report 2010. The National Library of Canada, Ontario, Ottawa. 44 p.
Nautiyal, J.C. 1988. Forest economics: principles and applications. Canadian Scholar’s Press, Inc. Toronto. 581 p.
Nautiyal, J.C.; Shashi, K.; Williams, J.S. 1995. A mechanism for tracking the value of standing timber in an imperfect market. Can. J. For. Res. 25: 638-648. Nee, V. 1998. Norms and networks in economic and organizational performance. The Am. Econ. Rev. 88(2): 85-89. North, D.C. 1990. Institutions, institutional change and economic performance. Cambridge University Press, New York, NY. 152 p.
North, D.C. 1993. Institutions, transaction costs and productivity in the long-run. Working Paper No. 9309004, Dept. of Economics, Washington University, St. Louis, Missouri, 10 p.
Ontario Forest Policy Panel. 1993. Diversity: forests, people, communities: a comprehensive forest policy framework for Ontario. Queen’s Printer for Ontario, Toronto. 147 p.
Oum, T.H. ; Yu, C. 1998. Winning airlines: productivity and cost competitiveness of the world’s major airlines. Kluwer Academic Publishers, Boston. 220 p.
Pearce, D.W. (ed.) 1992. The MIT dictionary of modern economics. The MIT Press, Cambridge, MA. 474 p.
Pearse, P.H. 1990. Introduction to forestry economics. University of British Columbia Press, Vancouver. 226 p.
Pejovich, S. 2008. Law, informal rules and the economic performance: the case for common law. Edward Elgar, Northampton, MA, USA. 178 p.
Pierson, P. 2000. Increasing returns, path dependence, and the study of politics. The Am. Pol. Sci. Rev., 94(2): 251-267. Pinzon, J.; Spence, J.R.; Langor, D.W. 2011. Spider assemblages in the overstory, understory, and ground layers of managed stands in the Istern boreal mixedwood forest of Canada. Environ. Entomol. 40(4): 797-808. Porter, M.E. 1998. Competitive advantage: creating and sustaining superior performance. The Free Press, NY, New York. 557 p.
Ribot, J.C. 2002. Democratic decentralization of natural resources: institutionalizing popular participation. World Resources Institute, Washington DC. 30 p.
Romer, P.M. 1994. The origins of endogenous growth. The J. Econ. Perspectives, 8(1): 3-22. Rosegger, G. 1986. The economics of production and innovation: an industrial perspective (2nd ed). Pergamon Press, New York. 275 p.
Ruttan, V. W. 1997. Induced innovation, evolutionary theory, and path dependence: sources of technical change. The Econ. J. 107: 1520-1529. Ruttan, V.W. 2001. Technology, growth, and development: an induced innovation perspective. Oxford University Press, New York, Oxford. 656 p.
Schumpeter, J.C. 1950. Capitalism, socialism, and democracy (3rd. edn.). Harper & Brothers Publishers, New York, NY. 431 p.
Seidl, I.; Tisdell, C.A. 1999. Carrying capacity reconsidered: from Malthus’ population theory to cultural carrying capacity. Ecol. Econ. 31(3): 395-408. Sen, A. 2001. Normative evaluation and legal analogues. Text of a public lecture at a conference on Norms and the Law held at the School of Law of Washington University, St. Louis. 21 p.
Sierra Club of Canada. 2004. Tenure Reform and Community Forests – a Sierra Club Fact Sheet. Ottawa, Ontario. 12 p.
Society for Ecological Restoration International & Policy Working Group. 2004. The SER international primer on ecological restoration. Tucson, Arizona. 14 p.
Solow, R.M. 1956. A contribution to the theory of economic growth. The Quarterly J. Econ., 70(1): 65-94. Solow, R.M. 1957. Technical change and the aggregate production function. The Rev. Econ. and Stats., 39(3): 312-320. Star, S.; Hall, R.E. 1976. An approximation of Divisia index of total factor productivity. Econometrica, 44(2): 257-263. Sterman, J.D. 2000. Business dynamics systems thinking and modelling for a complex world. McGraw-Hill, Toronto. 982 p.
Sutton, M.Q. ; Anderson, E.N. 2004. Introduction to cultural ecology. ALTAMIRA Press, Toronto. 383 p.
Temperate Forest Foundation. 2003. Eco-Link: Linking Social, Economic, and Ecological Issues. Technology in the Mills, vol 13(2). Temperate Forest Foundation. 2004. Eco-Link: Linking Social, Economic, and Ecological Issues. The Miracle Resource, vol 14(1).The Montreal Process Working Group: http://www.rinya.maff.go.jp/mpci/, accessed on March 18, 2011. Treasury Board of Canada Secretariat. 1998. Benefit-cost analysis guide. Retrieved from: http://classwebs.spea.indiana.edu/krutilla/v541/Benfit-Cost%20Guide.pdf on July 10, 2012. 92 p.
United Nations Conference on Environment and Development. 1992. The Rio Declaration on Environment and Development, Rio de Janeiro. United Nations Economic Commission for Africa. 2010. Economic report on Africa 2010: promoting high-level sustainable growth to reduce unemployment in Africa. Economic Commission for Africa, Addis Ababa, 236 p.
Williamson, O.E. 2000. The new institutional economics: taking stock, looking ahead. J. Econ. Lit. 38(3): 595-613. Wills, R.M. ; Lipsey, R.G. 1999. An economic strategy to develop no-timber forest products and services in British Columbia. Forest Renewal BC Project No. PA97538-ORE. Cogenetics International Research Ic., BoIn Island, B.C. 115 p.
Yang, F.; Kant, S. 2008. Rent capture analysis of Ontario’s stumpage system using an enhanced parity bounds model. Land Economics, 84(4): 667-688. This book will serve as an excellent reference for senior undergraduate and graduate students of: management science, development economics, and environmental and natural resource economics. Industrial and environmental policy analysts will also find it a useful source of several decision support tools.